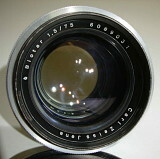 To adapt Contax lenses to K or M42 mount, see leitax.com. The K adapter there might work on Sigma SA if we put a 1.5mm spacer under it. Sigma SA cannot work with the aperture lever so just take that off.